I was recently contacted by Aussie etailer Glitter Kitty Nails and Beauty to review some polishes from the range they stock. Glitter Kitty only stocks brands that don't test on animals, such as Glitter Gal, Pretty Serious, Orly and Zoya. I was excited to get some Zoya polishes. 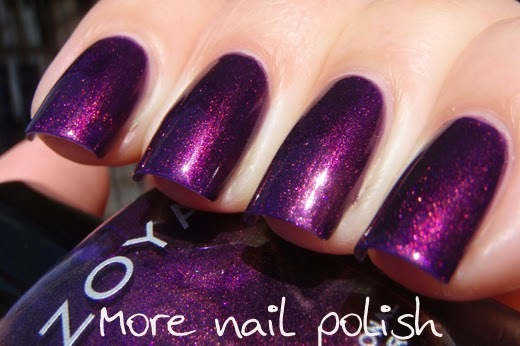 I don't own many Zoya's because they not that easy to purchase here in Australia. Looking at my spreadsheet I own 16 Zoyas, which means they make up less than 1% of my collection! The Zoya polishes I was sent were Yasmeen and Adina and whist these aren't new polishes (they have both been around for many, many years) but they are both just divine! Yasmeen - rich purple base with a dark pink shimmer. The formula is outstanding and it's opaque in two coats. Perfect, just look at the shimmer! 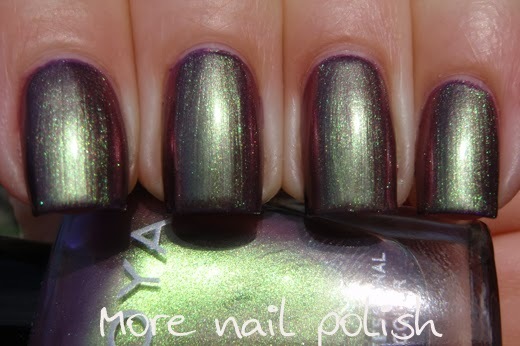 Adina - has a medium lavender purple base with a silvery olive green shimmer. Because of the lavender base I thought I would see what it looked like layered as one coat over Yasmeen. Layered it really shows off the green shimmer. Then I tried Adina just on it's own at two coats. The pale lavender base base is so pretty and you get to see a completely different duochrome shift. So now I've decided I need more Zoya polishes in my life. I already have some Pixie dusts, last years christmas collection and the 'big guns' like Ivanka and Crystal. But what other Zoya secrets are out there for me to discover? 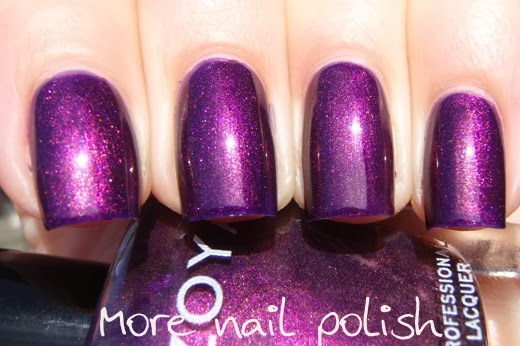 I'd love it if you could list off some of your favourtie Zoya's. OK, Go! The purple one is really cool. Rica, Zuza, Harley, and Storm are all stunning! Yasmeen looks gorgeous! I don't own any Zoya polishes, but I really wish I did! You NEED Ziv, since you're such a gold lover! Others that I love: Piaf, Rikki, Zuza, London, Lotus, Lola, Audrina (SO AMAZING), Elodie, Carly, Evvie, Gloria, Sarah. I have a lot of Zoya haha. I really love the purple-gold shimmers (Neeka, Tru), and their dusty cremes (Bevin, Dove). I also love Shawn, which is a dirty green colour - not sure if it's your kind of colour but I received so many compliments on it, including from a beautician who described it as "British racing green". FeiFei, Yara, Zuza, Sarah… Kristen is a lovely base for layering. Zoyas are definitely some of my favourite polishes!